Practice pronouns with this fun spin on Candy Land! 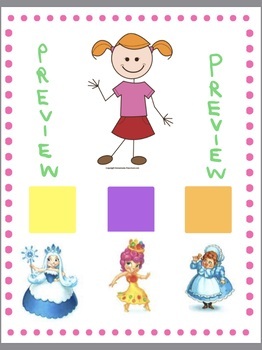 Pick up a Candy Land card and use this visual aid! Whichever color the student picks up practice using the phrase "HE likes blue candy or SHE eats purple candy" or "HE got blue candy or SHE licks purple candy". When the student picks up a Candy Land character, there's a visual aid included to practice "THEY" . If your Candy Land characters don't look like mine, I included a version without characters. Enjoy!